Colonel. Former member of Ornathia resistance cell. Part of historic Pullock V raid. Grateful to Shakaar for liberating his brother from Gallitep prison camp. 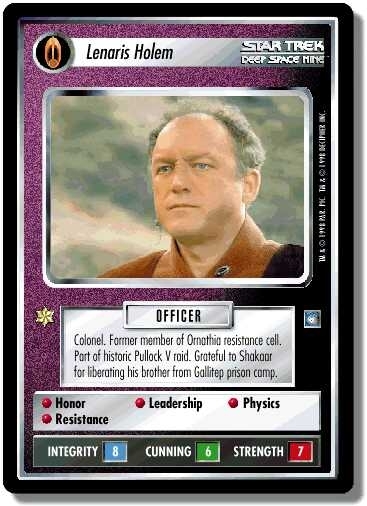 Characteristics: "Reshape the Quadrant"-related cards, affiliation, Colonel, Resistance, Bajoran species. There are 34 entries for Lenaris Holem (ST1E 5 R 154) at the Tradeplace (30 haves and 18 wants). Click here to see all trade list entries for this Rare card!